Sparkle Me Pink: The Easiest - Best Gadget You Need To Add To Your Blog Today ! 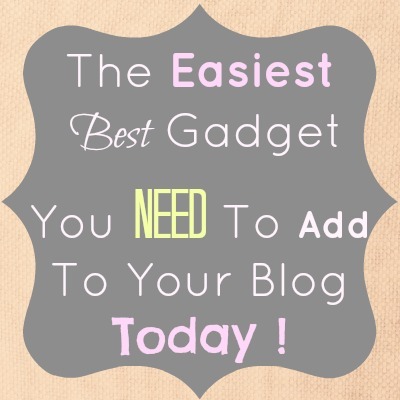 The Easiest - Best Gadget You Need To Add To Your Blog Today ! Seriously , this is probably the easiest gadget widget gidget thingy I have added to my blog yet ! Great question, see right below my post how it has 4 "You Might Also Like..." posts ?! What the gadget does it comprise four similar posts that your readers may also be interested in since they are already reading the current awesome post :-) why not help aim them to other posts/topics they would enjoy ? It is beyond easy to install. Go here to linkwithin.com and simply enter your email, blog address and the platform you post on and BAM instant easy step by step instructions on how to add the gadget to your blogger Layout . It took me all of maybe 2-3 minutes start to finish to add this feature to my page. PLUS it is FREE ! Invite your friends to give $10 and get $10 in Wittlebee credit! This is really neat, I've been meaning to add it to my blog! I have to look into this! Thank you soooooo much for the heads up!